Julie, aka Jaybird Quilts, and I have a running bet. I bet her last year that she couldn’t wear me out. 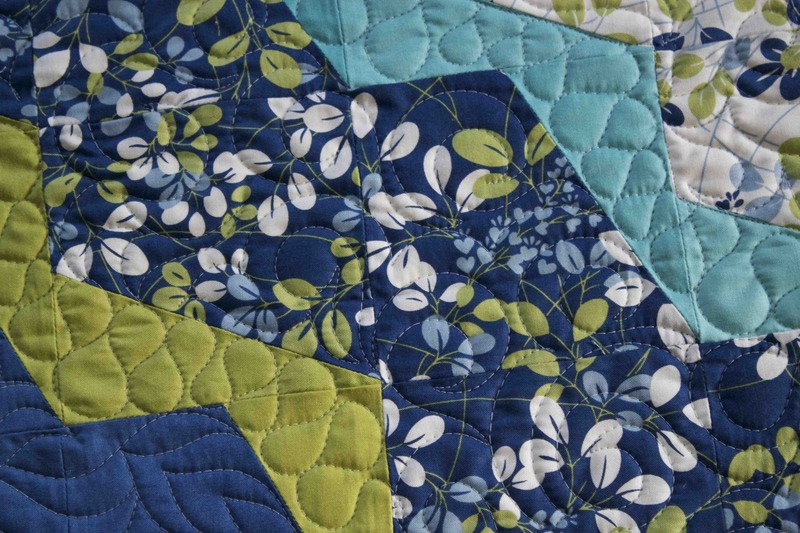 That I could handle as many quilts as she threw my way…..and this quilt market, she tried. 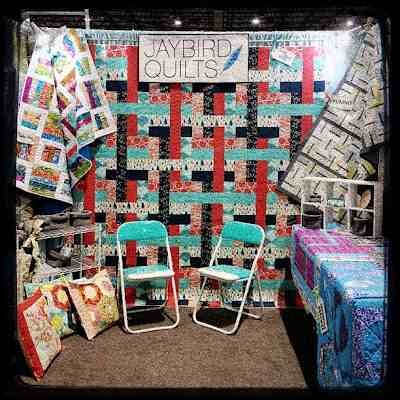 I quilted a bunch of quilts for her booth, and she nearly beat me…..I nearly couldn’t keep up with her. But I prevailed and am happy and slightly worn out! 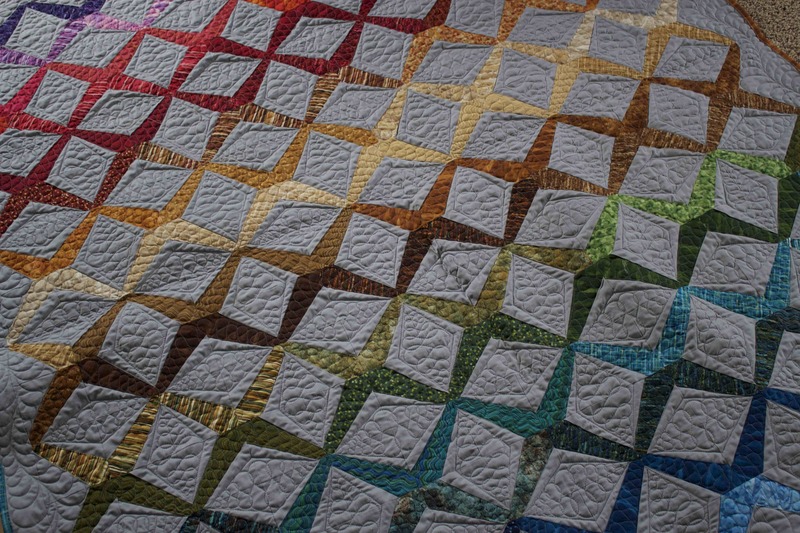 She released several patterns at this quilt market, but today I am going to show you her Ditto pattern. I really like this pattern and the diagonal lines that it creates. 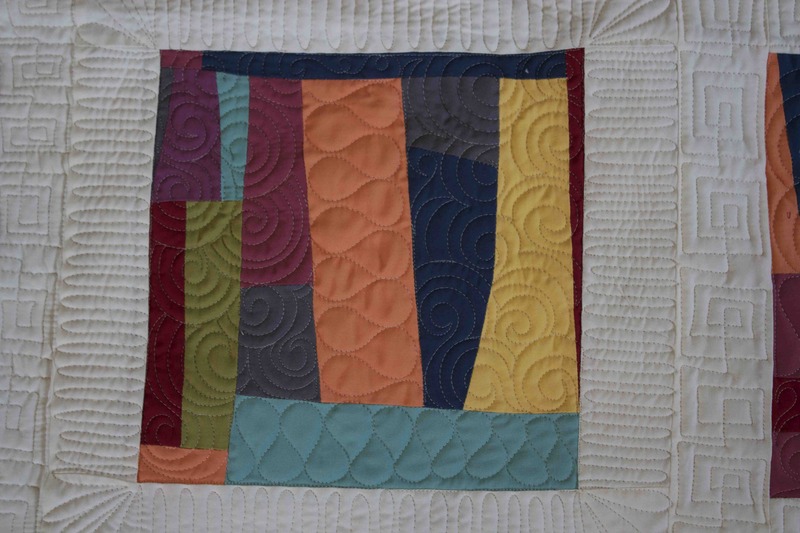 For this quilt, I quilted feathers in some of the “diagonals” and swirls in the rest. I know that Julie likes feathers, so I love to quilt them on her quilts. 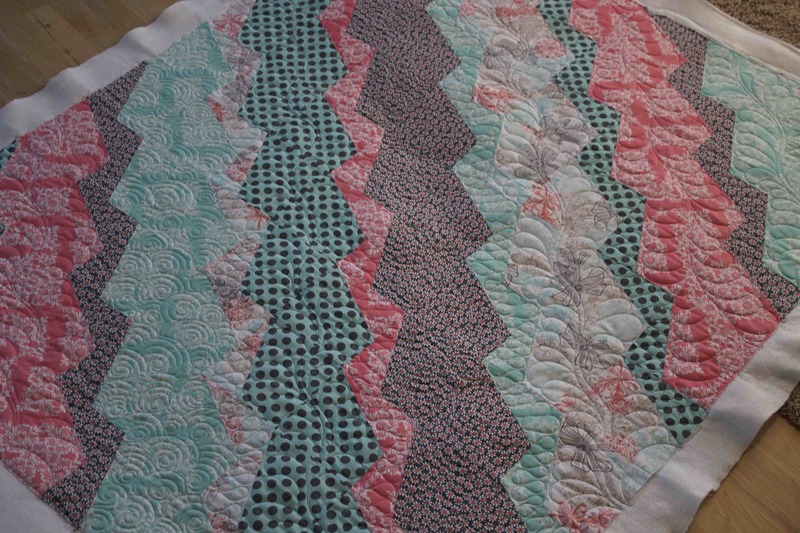 But I didn’t just quilt this Ditto quilt, I quilted a second one with Vanessa’s (V & Co) new fabric line, Simply Color. First of all, I love Vanessa’s fabric line. The blues and greens are perfect! 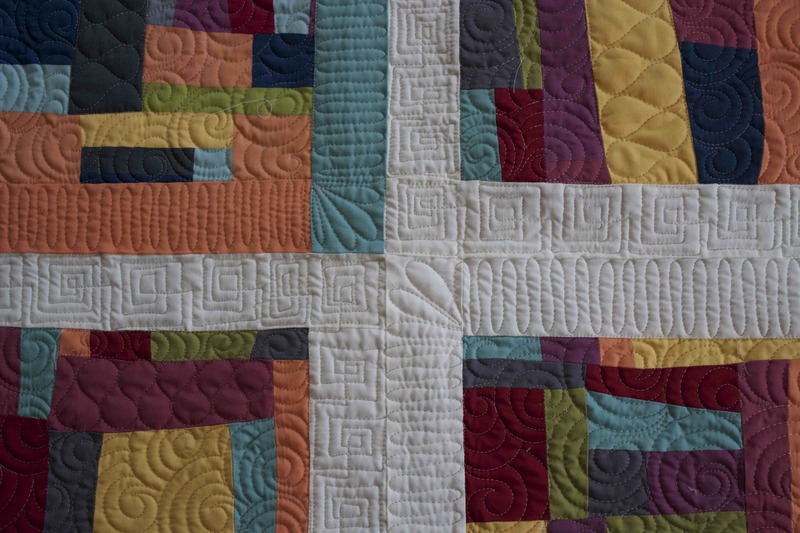 This quilt is a great example of “efficient quilting”. When I was quilting this quilt, I was running out of time. The closer I get to Quilt Market, the faster I need to be. 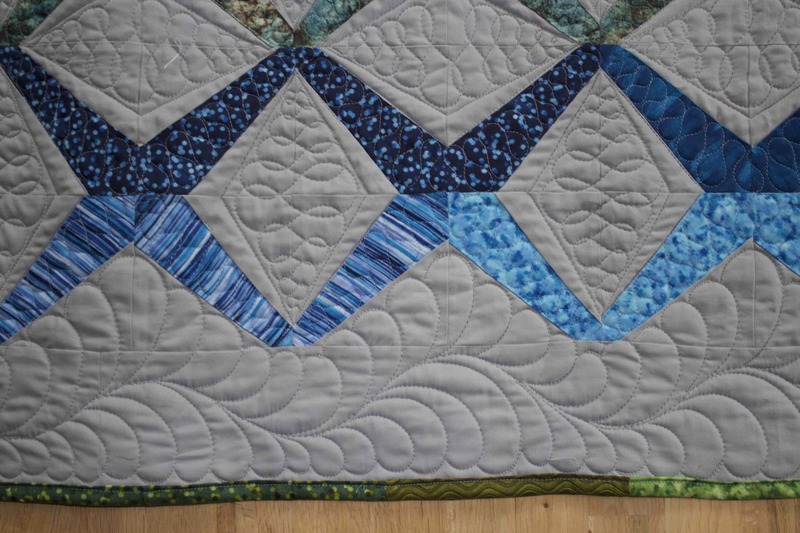 But even though I need to be quick, I can’t just quilt an allover…..so I use a few “illusions” to give a quilt a “custom” look as quick as possible! First, I determine which area(s) of the quilt will show the quilting the most. In those areas, I quilt the same way as normal. 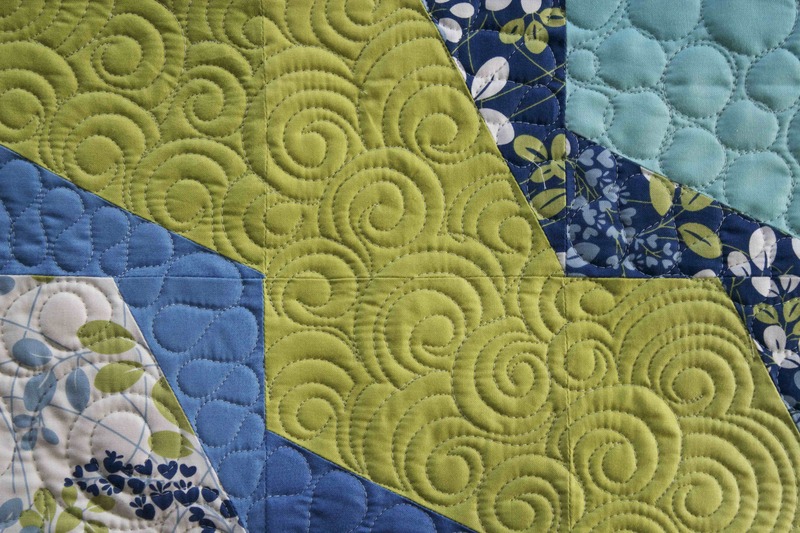 In this example, the area that showed the most was the green, so I quilted that with a swirl quilting design. Secondly, to quilt more efficiently (read: faster), I will quilt my favorite design on a bigger scale. So in this instance, I wanted to quilt circles, so I quilted them on a larger scale then I normally would. 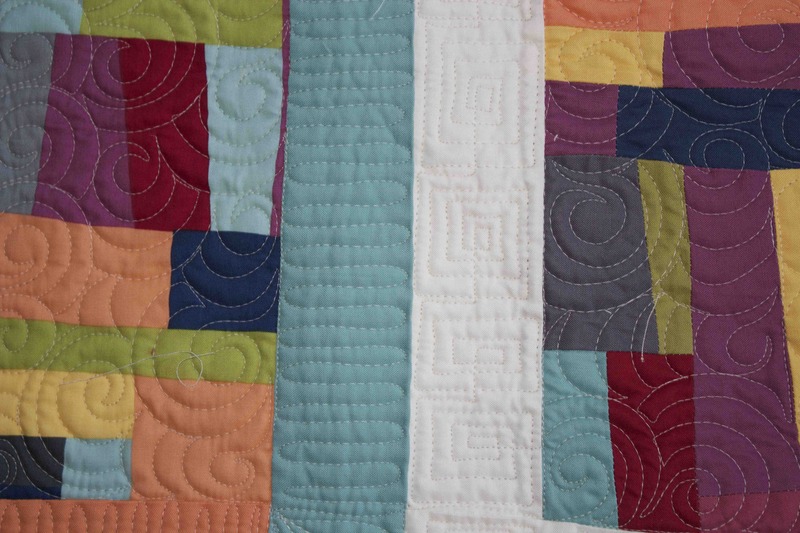 Then, in areas where the quilting won’t show up as much, I pick a design that I know that I can quilt quickly. 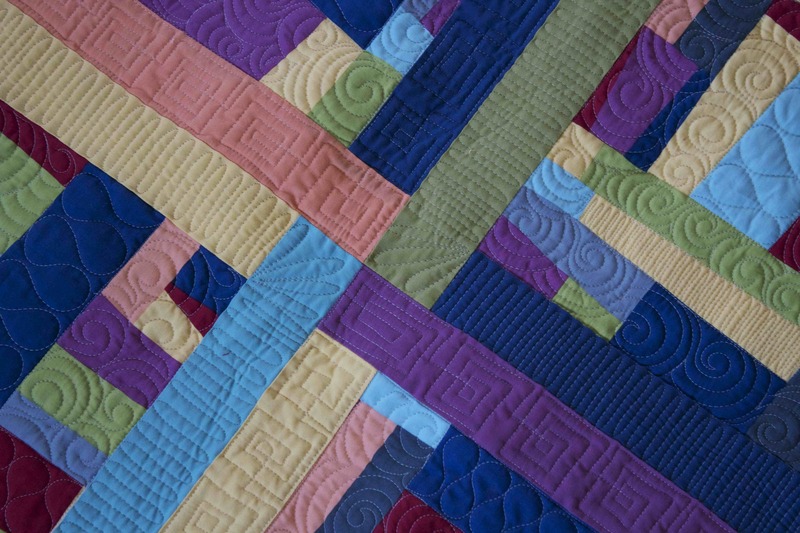 So in this diagonal line, I quilted a basic swirl. Something that would be quick and easy! 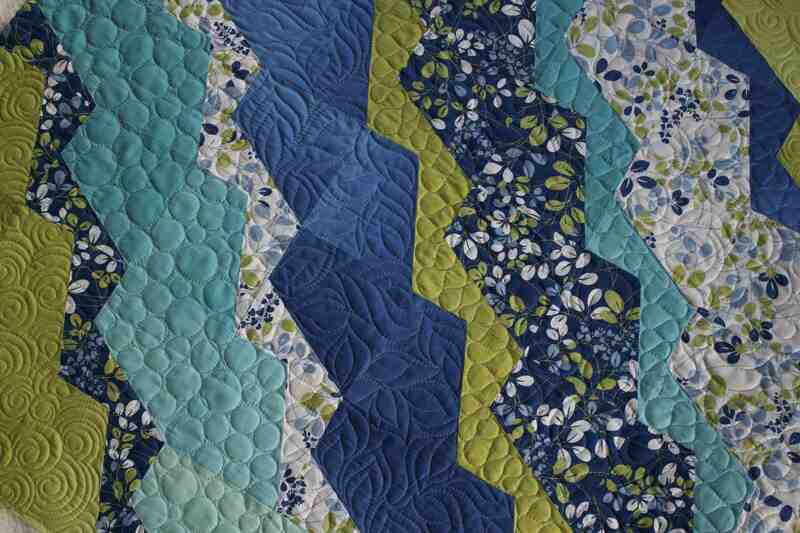 In the smallest diagonals, I picked a design that looks great but that I know that I can quilt quickly. 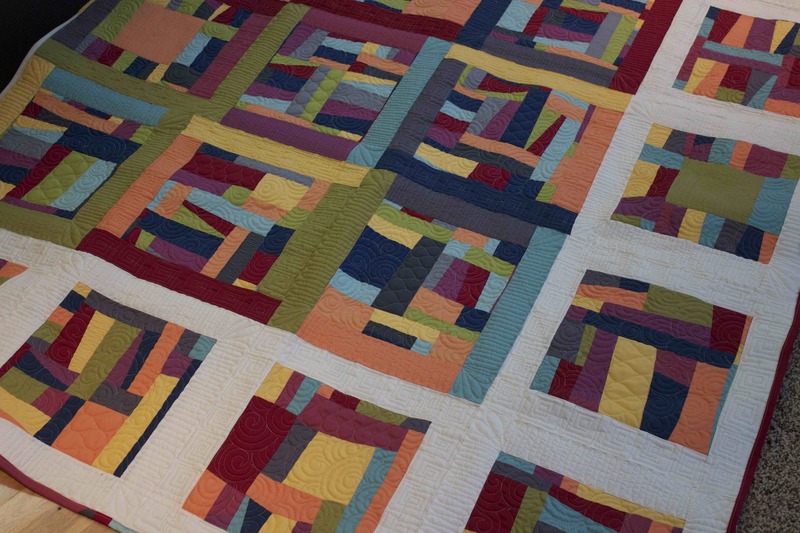 I love to quilt…..I love starting a new quilt and hoping it will turn out exactly like it looks in my head. I also love the satisfaction of finishing a quilt. I don’t think that there is anything wrong with “quick quilting”. I like to do the best job I can in the shortest time, and this quilt is a perfect example of just that! I will be back tomorrow with more quilts from Julie! First off, I hope that everyone has a great holiday today. We are having a big ol family get together, but we will also be remembering Grandpa, a veteran. We will also be giving thanks that we are free due to the sacrifice of so many. When I am quilting any quilt, I try very, very hard to avoid marking. Not only does it take time to mark it, it takes time to remove it as well. And there is nothing more frustrating than marking a quilt and still missing my mark! So when I can, I like to use the actual block as my guide. Here is a diagram of how I quilted the design in the gray diamonds. 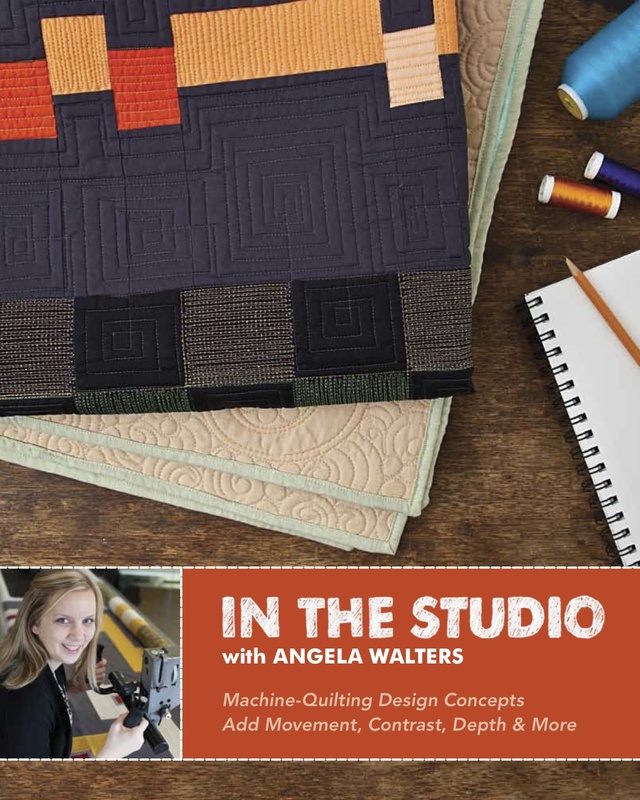 Step 1: Starting from one of the corners of the diamond, quilt a straight line that stops approximately 1″ inside the next corner of the diamond. I don’t mark the exact point, I just eyeball it and go for it! Step 2. 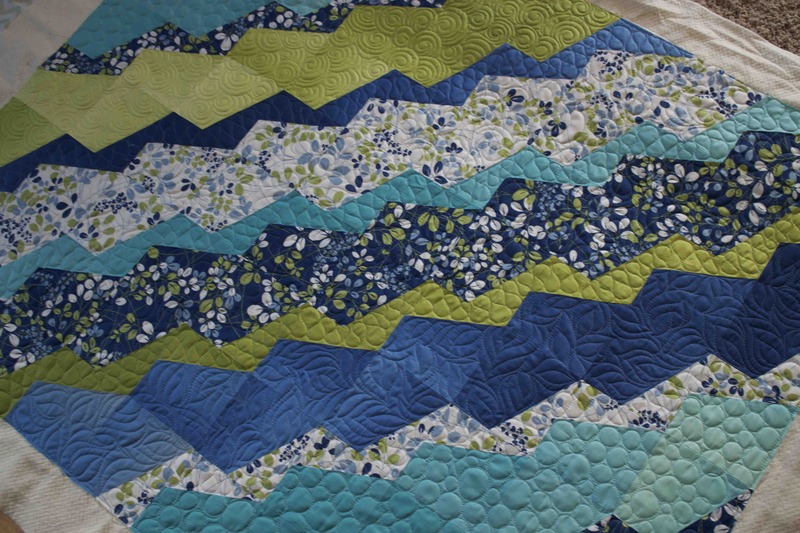 Pivot and quilt a line that actually touches the opposite corner than the starting point. Step 3: Quilt another straight line that ends 1″ inside the next corner. 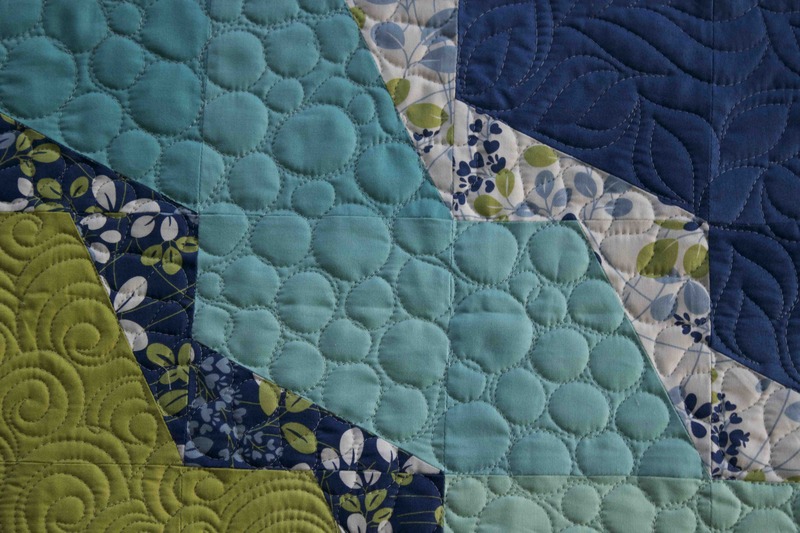 Step 4: Continue quilting until you end at the starting point. Step 5 (optional): If you wanted you could leave the inner diamond unquilted, but in this example, I quilted a figure 8 design from the starting point to the opposite corner. 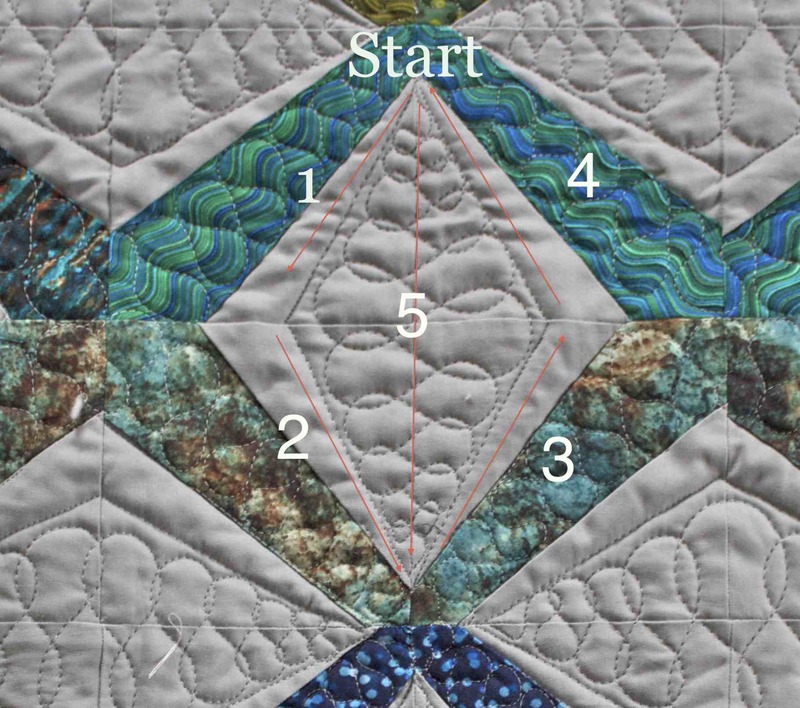 This quilting is fast and easy and I think you will find that even if you don’t mark the points, it will be close enough! 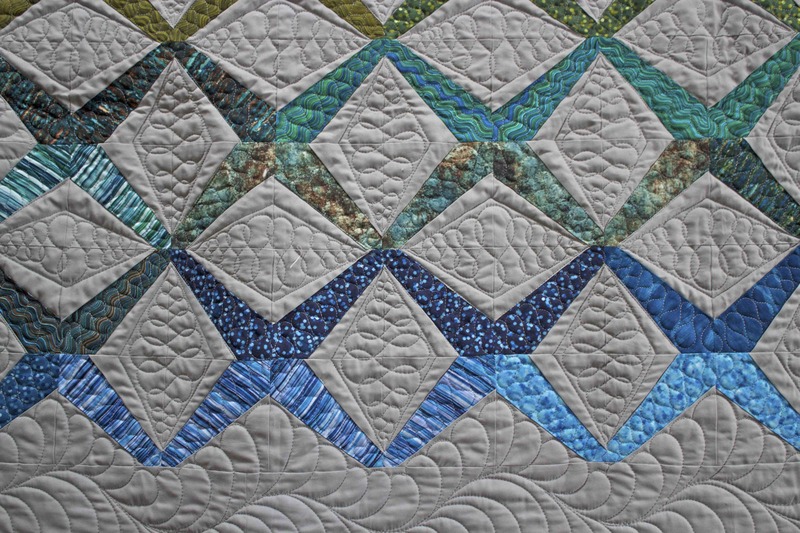 Use this design in diamonds or squares to add a custom look to your quilt without taking much longer than other designs! 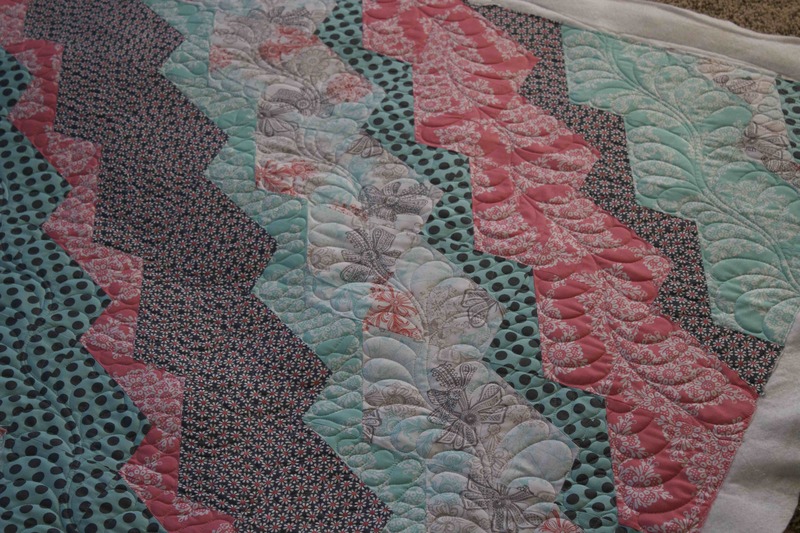 In the border, I quilted a feather……Just love to quilt those feathers! 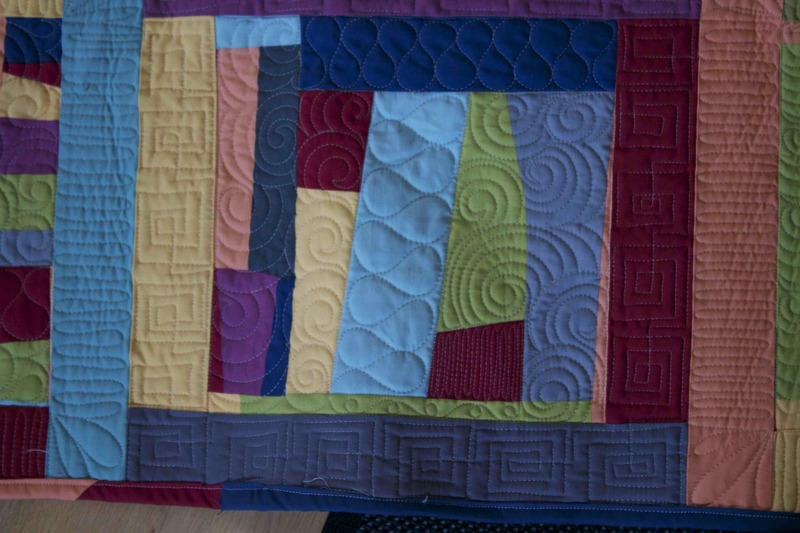 A shot of the back…..the waves on the fabric and the curves of the quilting really made a trippy illusion. 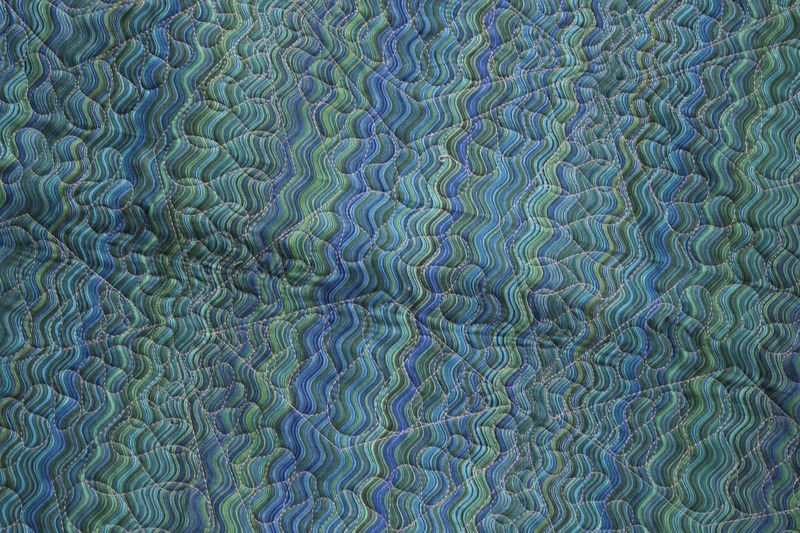 It made the fabric look like it was moving! What do you think? Is this a design that you could see yourself using on future quilts?? I sure hope so! I’ll be back with more Quilt Market recaps this week! Never miss out on your therapy session! Enter your email address to recevie posts via email.